The attack on a former Russian spy and his daughter in southern England, using a rare nerve agent, has brought a swift and relatively robust response from the British government. It has expelled 23 Russian diplomats, requested help from the Organisation for the Prevention of Chemical Weapons (OPCW) and brought the matter to the UN Security Council. 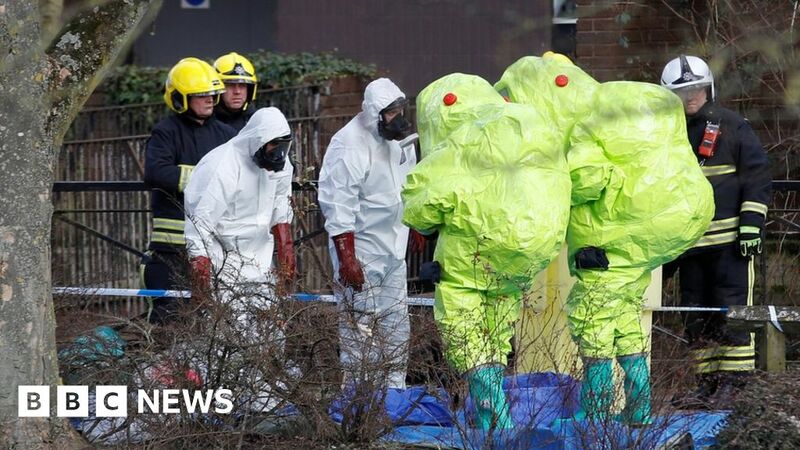 Moscow has strongly denied involvement, and the full investigation is likely to take several months, but the British government believes responsibility for the attack on Sergei Skripal lies with Russia, and is not hesitating to say so. It makes an instructive contrast with another, sensational chemical weapon attack: the killing of Kim Jong-nam, half-brother of the North Korean leader Kim Jong-un, which was caught on security cameras at Malaysia`s Kuala Lumpur International Airport on 13 February last year. Assigning blame Two women, poor bar workers from small towns in Vietnam and Indonesia and both apparently duped into believing they were taking part in a video prank, have been accused of wiping the lethal VX nerve agent on Kim Jong Nam`s face. Their trial on murder charges began last October and is likely to continue for several months. But at least five North Koreans who are believed to have organised the attack and recruited the two women -one, the oldest, going by the name Ri Jae-nam, a known North Korean intelligence agent - are still at large. The Malaysian authorities have done little to investigate the role of the North Korean government, and have, with one exception, never even suggested that North Korea was responsible. Just why Malaysia should be so reluctant to get to the bottom of a brazen and dangerous political assassination is still unclear. Malaysia was, understandably, caught off-guard when the attack happened. The ailing Kim Jong Nam sought medical advice in the airport terminal, and then died within 20 minutes. The security guard who first accompanied him to an airport clinic reported him as a South Korean, although he was travelling on a false North Korean diplomatic passport under the name of Kim Chol. That error, it seems, quickly alerted South Korean intelligence agencies, who identified him as the North Korean leader`s half-brother, and turned what might otherwise have seemed just a mysterious illness into something more sinister. It would be several days before the police realised he had been contaminated with one of the world`s deadliest nerve agents, produced by just a handful of states. Speedy arrests Within three days of his death, Malaysian police had arrested a Vietnamese woman, Doan Thi Huong, and then the Indonesian Siti Aisyah. The police also published the names of four North Koreans who flew out of Malaysia the same day, and sought the assistance of Interpol, which issued a "red notice". Three other suspects remained holed up in the North Korean embassy. Another North Korean who drove the team to the airport for the attack was detained, but quickly released and allowed to leave the country. The first autopsy on Kim Jong-nam was inconclusive. Five days after his death the police announced there would be a second. `Hostages` in Pyongyang At this point the North Korean government and its ambassador, Kang Chol, fired off a torrent of criticism at the Malaysians, accusing them of conspiring with South Korea and fuming over their rejection of North Korea`s request to repatriate the body. This outburst prompted the first official Malaysian government statement on the attack on 20 February. It denounced the ambassador`s comments as based on "delusions, lies and half-truths". Kang Chol was later expelled from Malaysia. The Malaysian police officially confirmed the use of VX only on 24 February, and on 3 March the government issued a statement condemning the use of the nerve agent. It did not, however, link the attack in any way to North Korea. In fact the only time Malaysia has ever directly accused North Korea was on 8 March, when it transpired that three Malaysian diplomats and six family members were being prevented from leaving Pyongyang. An outraged Prime Minister Najib Razak described them as "hostages", held by a state that he said had assassinated its own citizen on Malaysian soil, using a banned chemical weapon. In the following days, though, Mr Najib softened his tone as he sought the release of the trapped Malaysians, eventually agreeing to allow the three North Korean suspects in the embassy to leave. The police took statements from two of them, and pronounced themselves satisfied. They also agreed to release the body of Kim Jong-nam, after apparently being given DNA samples from a next-of-kin. Who that next-of-kin was, and how the DNA was delivered and authenticated, was never explained. North Korea still refuses to acknowledge that the dead man is Kim Jong-un`s half-brother. Mystery third man But the identity of the third man in the embassy was not disclosed at the time, nor was it ever confirmed whether he left Malaysia with the others. Only after the trial began did the main prosecution witness, the lead investigating officer Wan Azirul Nizam Che Wan Aziz, admit that the third man was Ri Ji U, identified by Siti Aisyah as the man calling himself "James" who had recruited her for what she thought was a filmed comedy stunt. The police did not interview him in the embassy, Assistant Superintendant Aziz said, because they had received no instructions to do so. He had not checked whether Ri Ji U had left the country, he said. He only added to the confusion by identifying another suspect, one of the four North Koreans who left right after the attack, as also using the pseudonym "James". In his responses to cross-examination, Assistant Superintendant Aziz has at times been vague and contradictory. For example, he testified that the police had no passport details for the absent North Koreans, forgetting that they actually showed passport numbers for three of them, presumably taken from immigration records, to journalists last February. The defence team has also questioned the police failure to seek out at least one known witness in Vietnam. She has now given a sworn statement that she introduced Doan Thi Huong to a man called Li, who they both believed was a talent-spotter for comic films. Li is believed to be Ri Ji Hyon, the son of a former North Korean Ambassador to Hanoi who speaks fluent Vietnamese and who left on the day of the attack. An odd way to prosecute Throughout the trial the defence lawyers have highlighted what they say are serious flaws in the prosecution`s case. By failing to hold any of the North Korean suspects, the defence lawyers argue, the police lost key witnesses whose testimony was critical to their clients` defence. Some of the witnesses would have had diplomatic immunity, but that does not prevent the police from interviewing them. But what has been most striking about the prosecution case is the refusal to consider, or even mention, the likely involvement of the North Korean government, or to investigate any information leading in that direction. When the defence brought up a media report that Kim Jong-nam had met a mysterious Korean-American, possibly an intelligence agent, on the Malaysian island of Langkawi just before he was killed, and that he had transferred data from his laptop to a USB thumb-drive, Mr Aziz admitted that the police were aware of the meeting, but said he could remember nothing about it. It is hard to imagine that this was not worth investigating further, but there is no evidence that the police have done so. Oddly, the prosecution are even echoing the North Korean denial that the victim was indeed Kim Jong-nam, only referring to him by the name on his false passport, Kim Chol. The murder of Kim Jong-nam has excited huge interest in how and why it was carried out. As with other spectacular crimes it was widely assumed that all the testimony heard in the trial would fill in the gaps, presenting a much clearer picture. For whatever reason Malaysia is choosing to let North Korea`s presumed role in the killing remain in the shadows.